Oban is a small town on the western coast of Scotland near the island of Mull about 95 miles North of Glasgow. During WW2, merchant ships gathered there under the protection of the Royal Navy and joined up with larger convoys to the USA, Russia and elsewhere. 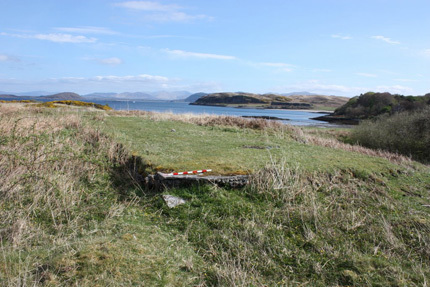 A few miles to the north is Ganavan, a headland which offers an excellent view of the waters around Oban. 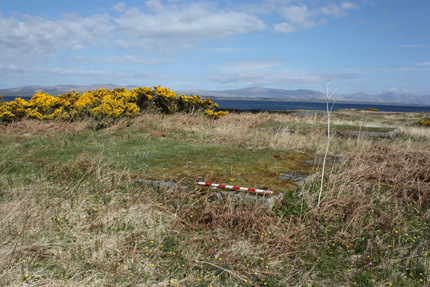 It was on Ganavan headland that the Royal Navy established the "Little Ganavan" anti-submarine Indicator Loop Station. This is its story. 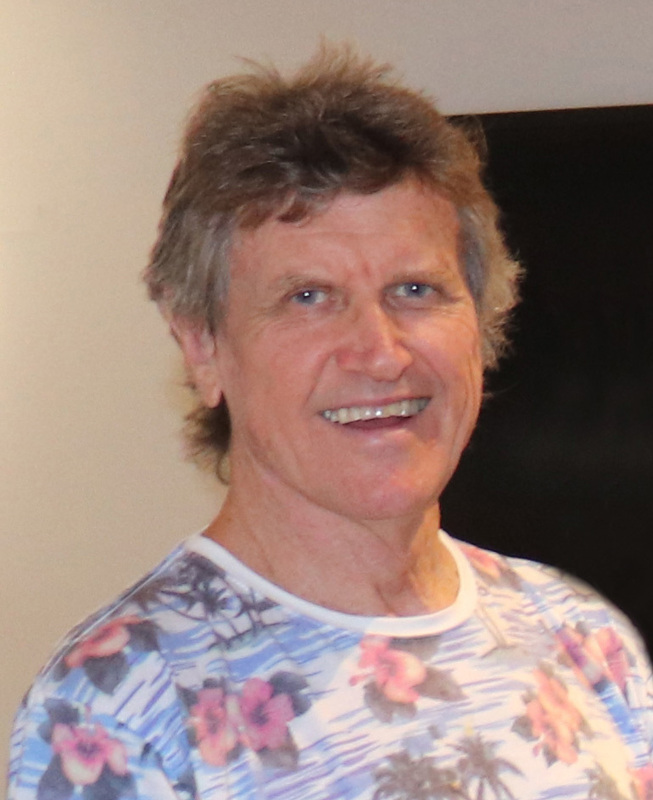 My thanks to Martin Briscoe for providing the photos for this webpage. Anti-submarine 'indicator loops' are long lengths of cable laid on the seabed in shipping channels of strategically important ports. They rely on the production of an induced current in a stationery loop of wire when a magnet (in this case, a submarine or surface ship) moves overhead. Even if wiped or degaussed, ships (including submarines) still have sufficient magnetism to produce a small current in a loop. The current is detected by galvanometers at a Loop Control Station on the shore. This technology was developed by the British Royal Navy at HMS Osprey (Portland Naval Base) and HMS Vernon starting back in 1915 and first deployed at Scapa Flow, in the Orkney Islands at the northern tip of Scotland. In 1996, a portion of the Oban Bay loop cable was brought to the surface by a clam dredger about 500 m offshore from the island of Lismore just to the north of Lismore lighthouse. It was actually marked as a navigation hazard for a time. Encrustation meant that the cable is now a pretty inflexible and bulky object. 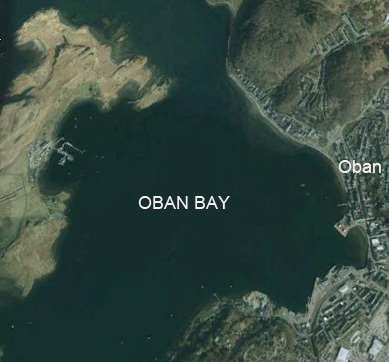 Location map of Oban. Glasgow was 95 miles to the south-east. It was a favourite place of Queen Victoria no less. 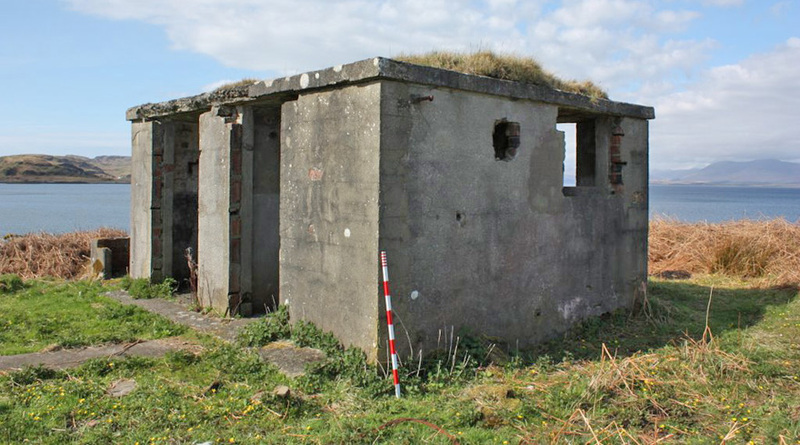 The map below shows the disused harbour defence control huts used by the Royal Navy for its antisubmarine indicator loop defences in World War 2. 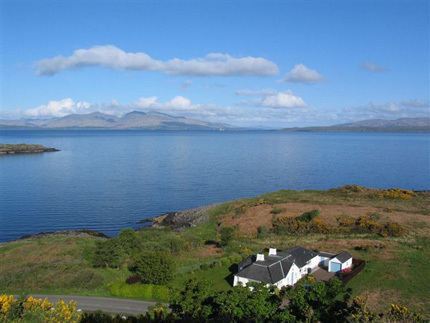 They are located at Ganavan headland near Oban Bay - Argyll, Scotland - 95 miles north-west of Glasgow. 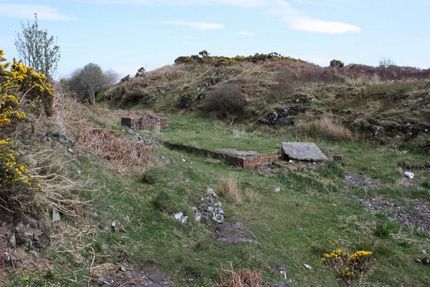 The land is currently owned by Dunollie Estates and tenanted by farmer Alaistair MacLeod - a special constable at Oban. 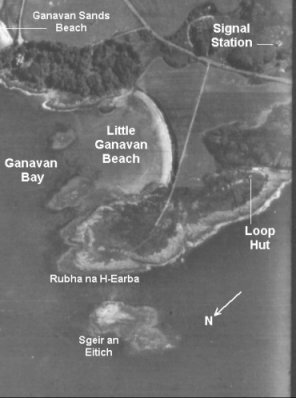 Photo of Ganavan headland taken in 1945. 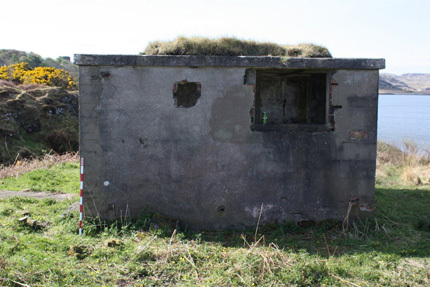 During the war the area was surrounded by a barbed-wire fence and the huts were hidden in the bush and not visible from the road or the signal station. 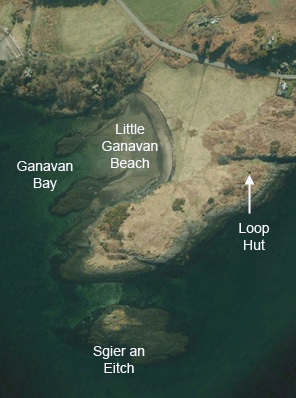 Google Earth image of Ganavan headland taken in 2010 orientated to match photo on left. Today, the area is more open and grassy and the remains are quite visible from the road. 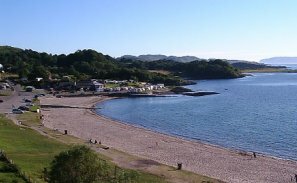 Google Earth image of Oban and Little Ganavan Bay (2010). 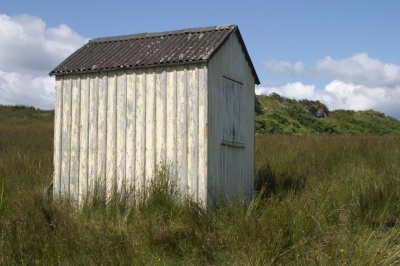 To get to the Loop Hut, start in the middle of Oban town on the Esplanade (the War and Peace Museum for instance) and continue North straight along Gavanan Rd 2.2 km until the last house. 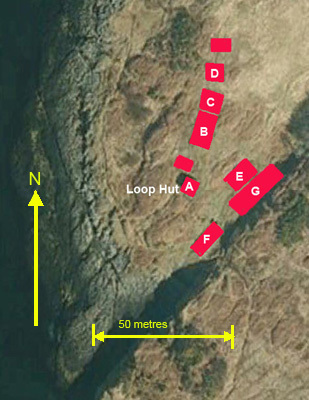 On the headland to the north-west are the loop huts. It looks flat from the air but is quite hilly. Go a bit further and there is easy parking at Little Ganavan Beach. Continue along to Ganavan Sands Beach (where the floatplanes landed). 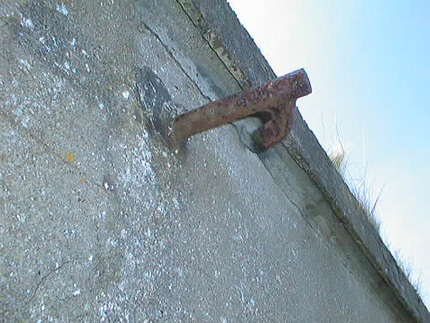 In the 1930s, Admiralty policy was that important harbours should be progressively defended by fixed anti-submarine defences consisting of one or more indicator loops. Loops took a fair while to survey, plan and lay and this lead time was thought necessary. If hostilities arose, the plan was that the Royal Navy would then lay harbour defence Asdics (HDAs) and controlled mines. 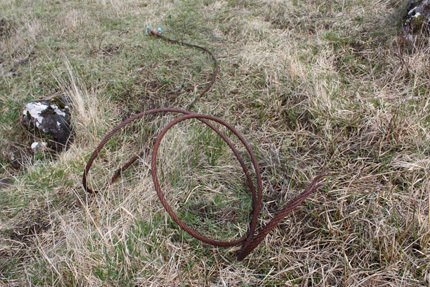 However, it became apparent that the cost of repairing and maintaining existing loops was becoming prohibitive so the laying of more loops had to wait until conflict occurred. By 1938, the possibility of conflict with Germany was most likely so loop laying was stepped up. By 24th August 1938, four ports were protected (Portsmouth, Portland, Plymouth and Firth of Forth) with the Straits of Dover being added in Autumn 1939. Two others - at Penang and Singapore - were also under RN control. Others, such as Falmouth, Berehaven, Queenstown, St George's Channel, North Channel and Tynemouth were planned for 1940-41 as well as overseas loops at Singapore, Alexandria and Malta. No loop station was planned for Oban Bay. 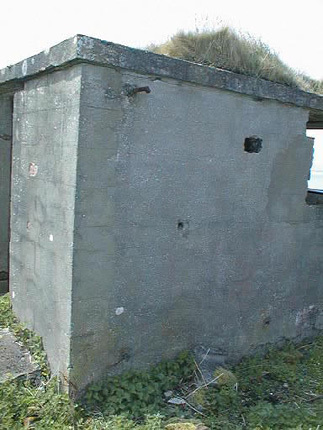 In early 1940, with the imminent fall of France and the threat of invasion, many emergency coast batteries and harbour defence stations were constructed. On the 6th February 1940, the Admiralty decided that Oban Bay should be used as an additional naval base to the Kyle of Lochalsh, which was the gathering point for convoy ships but could not provide the facilities that Oban could. The role of the navy was to protect and administer the harbour and surrounding waters, to accommodate merchant ships in the anchorage and organise the sailing of the convoys to join with larger convoys to the USA, Russia and elsewhere. The naval detachment at Oban grew as France fell and more and more convoys were rerouted from the English Channel and South Ireland to the waters between Northern Island and Scotland. The loss of the Irish ports was greatly felt. So the loops were finally laid at Oban. There were two loops at Oban Bay. 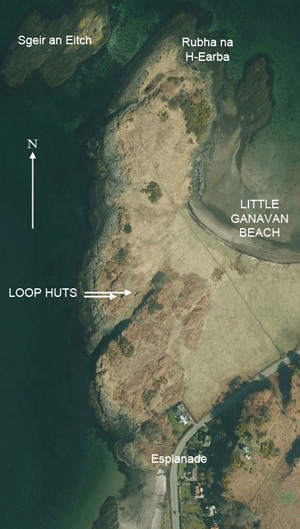 It would seem that Loop 1 went from Ganavan headland (just a little bit north of Maiden Island) across to the beach to Gorten just north of Loch Dun on the Island of Mull. 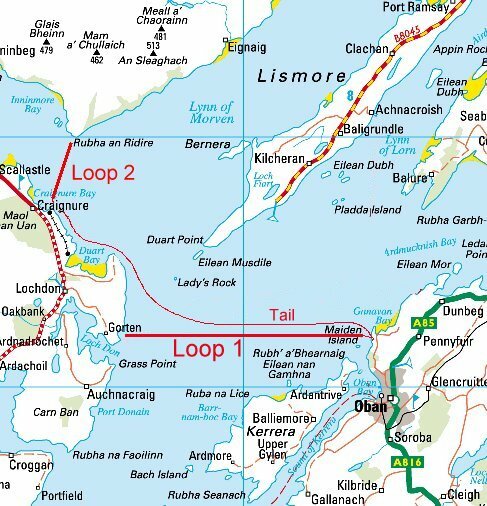 Loop 2 stretched from Craignure (on Mull) across the Sound of Mull to the tip of the Morven district (Rubha an Ridire). The USN set up about a dozen 'loop receiving stations' on the East Coast, Panama and San Francisco. The Royal Australian Navy installed indicator loops at a dozen sites around Australia and Port Moresby from 1939 to 1942. Loops were also installed by the RNZN at Auckland Harbour in 1942, and by the RCN at Saint John, Digby and Prince Rupert (Canada) from 1942 onwards. This Luftwaffe reconnaissance photo of Kerrera Sound was taken in December 1940. 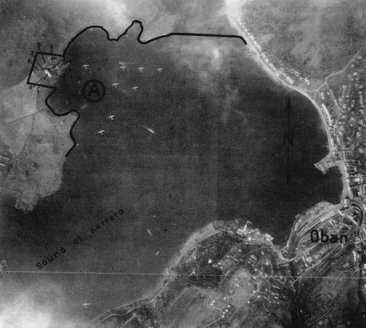 It shows the naval base at Oban and aircraft of 210 Squadron RAF at their moorings. Google Earth image December 2010. The Loop Hut is about 1.3 km north of the top of the image. The loop cable came down near the top of Kererra Island (to the left) and monitored access into Oban Bay from the north. 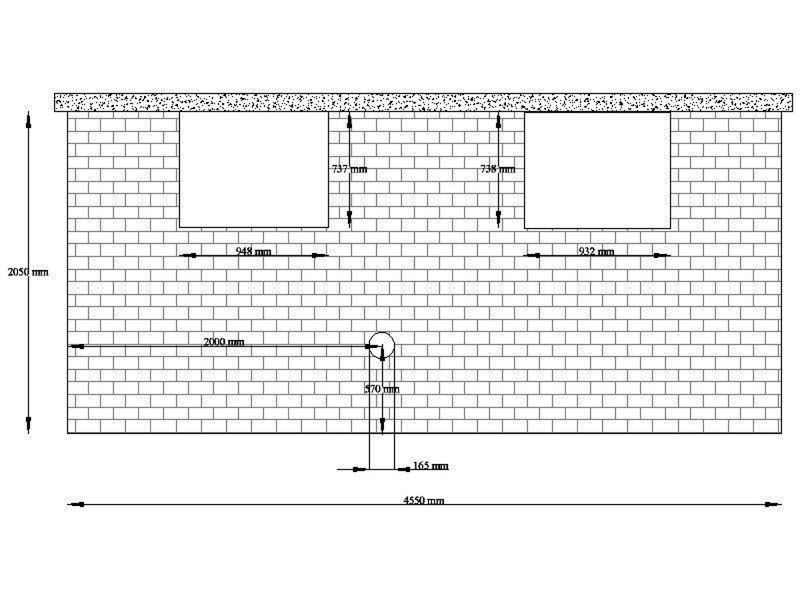 The diagram above left shows the relative location of the concrete huts and slabs. Only buildings A (The Loop Hut) and E (The Generator Hut) remain standing today. 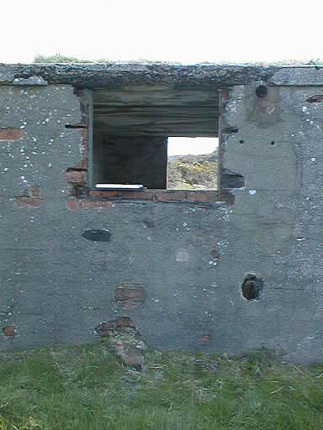 The photo on the right shows the huts as they were in 1945. The operation of a Loop Station was fairly straightforward. 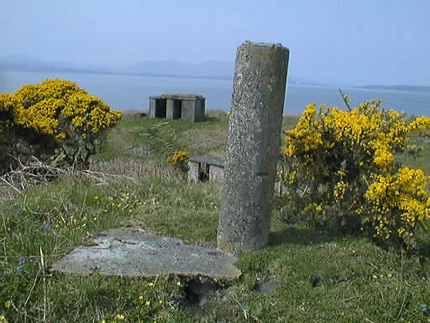 Once the signalmen at the Port War Signal Station (see later) identified a ship entering or leaving the area (by Aldis lamp or signal flags) they would relay this information to the Loop Control Hut by telephone and this would be noted in the Loop Station's log book by the Officer in Charge. 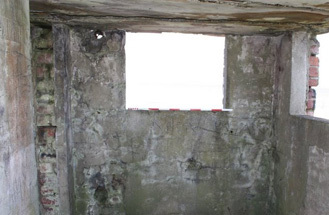 The watchkeepers in the Binocular Room of the Loop Control Hut would constantly monitor the waters over the loop for ships and also monitor the recorder chart on the wall in the Loop Room. Once a message had been received from the PWSS they would keep an eye out for the ship. The watchkeeper on the loop recorder (either a paper roll or on a screen) would wait for the characteristic "signature" of the ship and call out "crossing on one" to indicate the crossing of loop "1" (or Loop 2 as the case may be). Such a watchkeeper was well trained for this work - usually at HMS Osprey at Portland or later Dunoon. They would be designated "Submarine Detector" (SD) after a short course, or "Higher Submarine Detector" (HSD) after the long course. The officer would scan the loop area with his binoculars and if a ship was visible he would call out "ship" to confirm the crossing, and note this in the log book and match it with the ship's name. If a signature appeared on the recorder chart ("crossing on one") but when the officer looked and nothing was visible through his binoculars, the officer would say "non ship" to indicate that nothing was there. This would strongly suggest that a submerged submarine had crossed the loop and hence would be an enemy submarine (for friendly submarines always entered a harbour on the surface). The officer would then relay this ("sub on Loop 1") to the PWSS who would decide what to do. For a definite loop crossing but where "no ship" was visible, a harbour patrol vessel (armed with machine guns and depth charges) would be sent ot investigate. 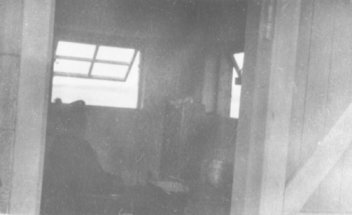 This photo of a naval rating in the Indicator Loop room of the Control Hut was taken during WW2. It is the same room as shown to the left. The rear and side observation windows and frames are clearly discernable although the equipment being monitored by the rating is not clear. The wooden door, door jamb and cement-rendered brick is visible. 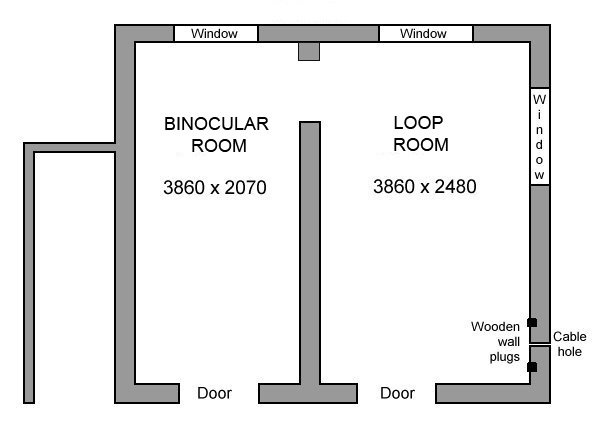 The floorplan of the Loop Control Hut (Building "A"). 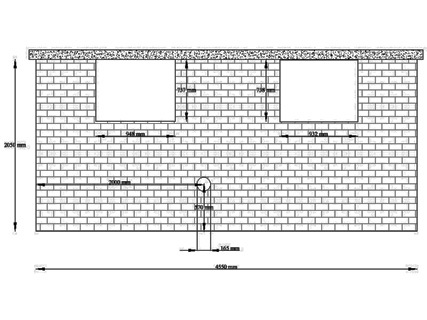 Walls are double thickness brick (230 mm wide) and the windows are 1200 mm wide and 900 mm deep. On the right there is a small hole in the wall through which cable (probably power) runs. 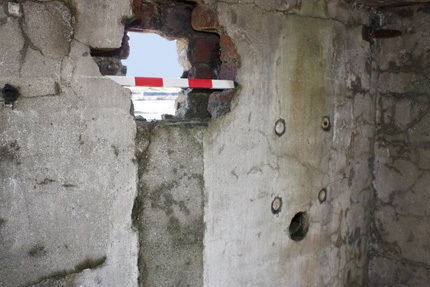 Above it are four pieces of dowel embedded in the wall to which some equipment was affixed. 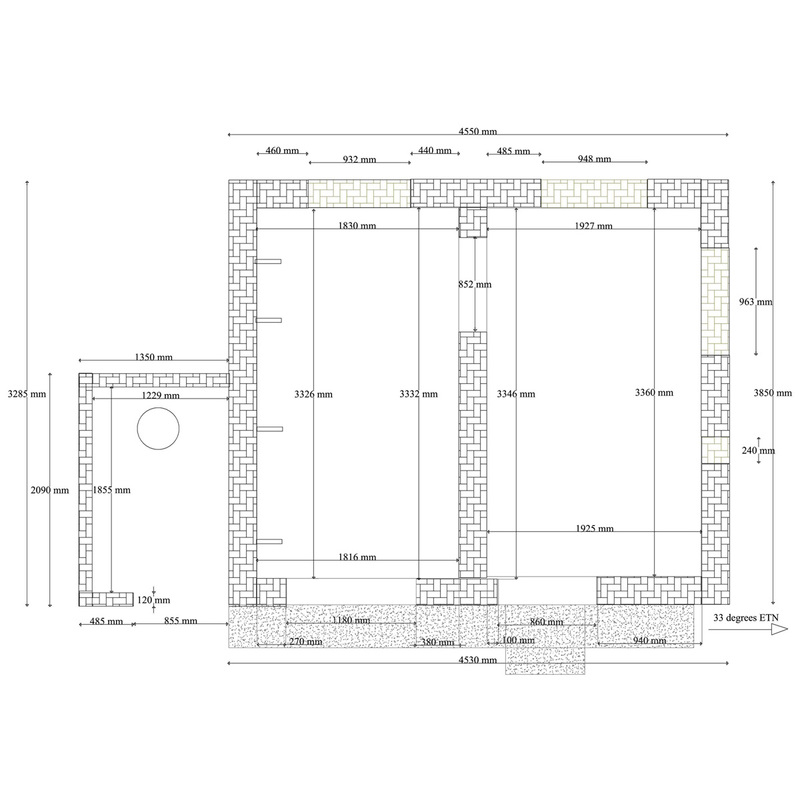 Building "E" - The Generator Hut - floorplan. 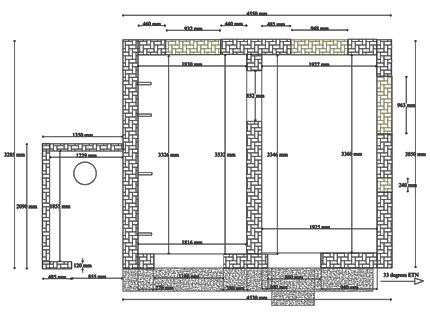 The walls are double layer bricks about 230 mm thick. 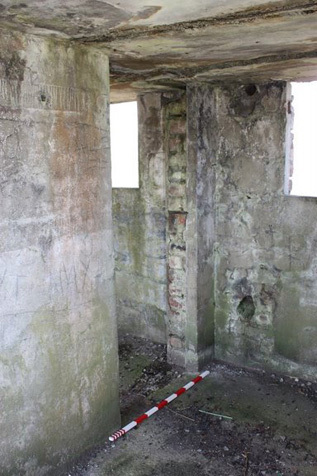 It is difficult to know what each room was used for but I suspect that the left room was the fuel store, the middle room housed the motors and generators, and the rightmost room seems like it was the workshop. 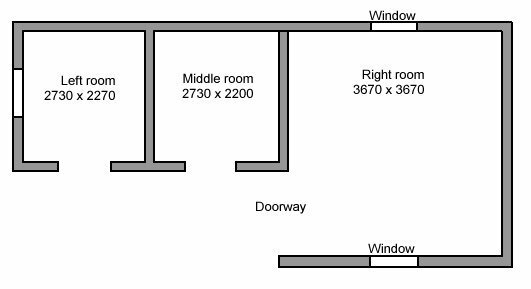 Plan of the Loop Hut (Martin Briscoe). Click image to enlarge. 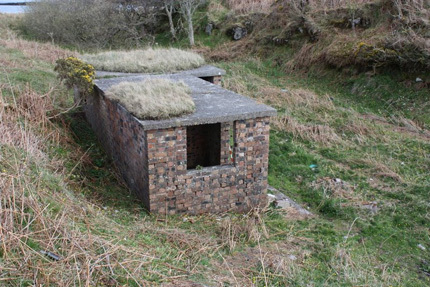 Rear elevation of the Generator Hut (Martin Briscoe). Click to enlarge. 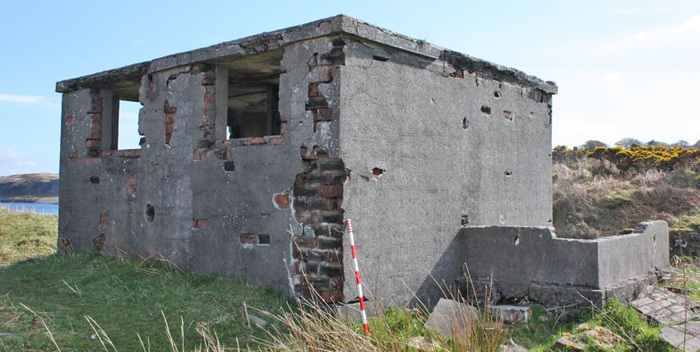 About 250 m up the hill south of the Loop Station was the Port War Signal Station. Watchkeepers would monitor ships entering and leaving the area by use of Aldis lamps or flags. A ship would signal or be challenged by the PWSS and would give its own identifying signal. This information would be relayed by telephone to the Loop Control Hut. 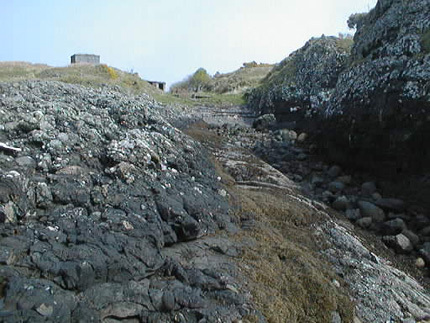 Coming ashore at Gorten on Mull (see map above) are some cables that are most likely WW2 "tail" cables for the No. 1 Indicator Loop. The cables were photographed by Geoff Twibell. 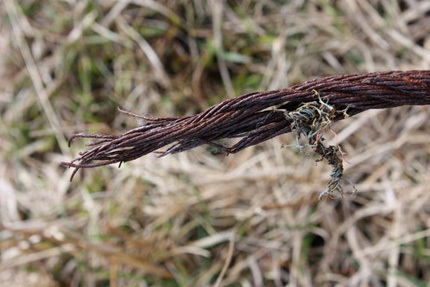 He describes them as follows: There are some six steel-sheathed cables in all, three of them having frayed down to the inner cores. One contains four rubber-covered cores - possibly "loop tails". Another contains a single, larger core. 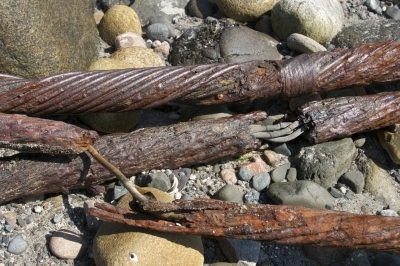 The remaining cable is post WW2 and contains four PVC insulated cores one red, one blue and two white. 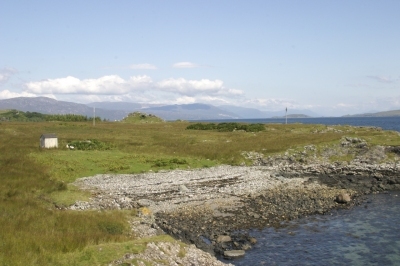 The six armoured tail cables at Gorten Gorten shoreline with hut in background. 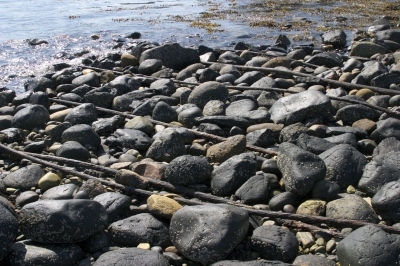 Cables run up this rocky shore. 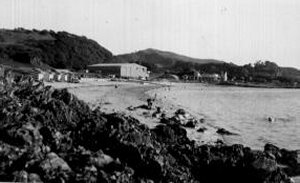 At Ganavan Sands beach (on the north side of the headland where the loop huts were located) there was an RAF flying-boat base where maintenance and training was carried out. A hanger and several engineering sheds were built there to house the operations. The photo above on the left shows the Number 302 Ferry Training Unit based at Ganavan Sands where they trained crews to fly their aircraft over long journeys to such destinations as Africa, Asia and even Australia. The photo on the right is of the Ganavan Sands Caravan Park which held the site for many years until a new housing estate was built. 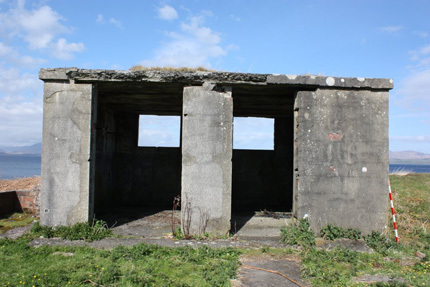 Little remains of the RAF base, however, the steel runners of the hangar doors and the former generator shed may still be there. 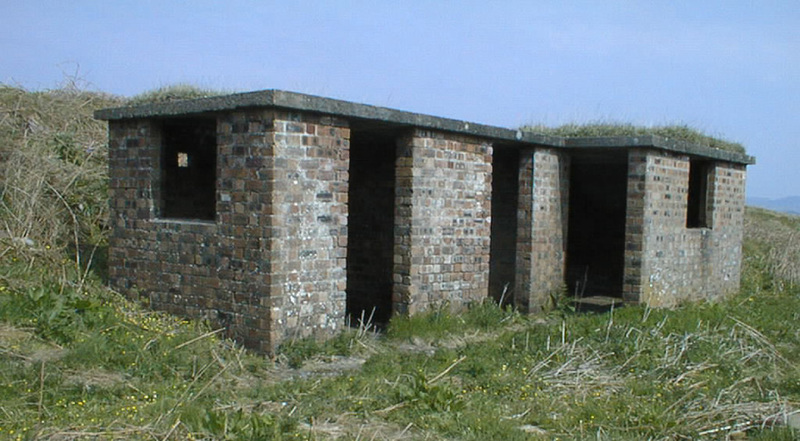 The indicator loop huts were on the headland at the rear of the photo. 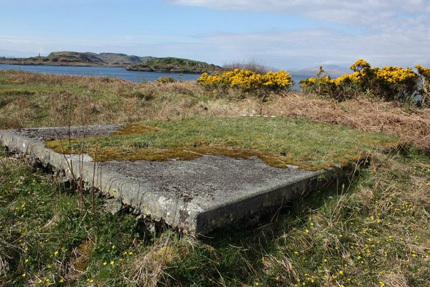 RAF Base image taken from Paul Burns' RAF Oban web page. 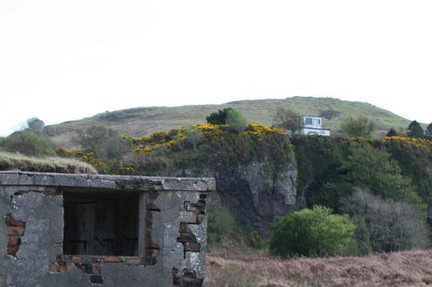 There is a minefield control tower at Gallanach overlooking the Sound of Kerra; it lies on the hillside on the south side of a caravan park. 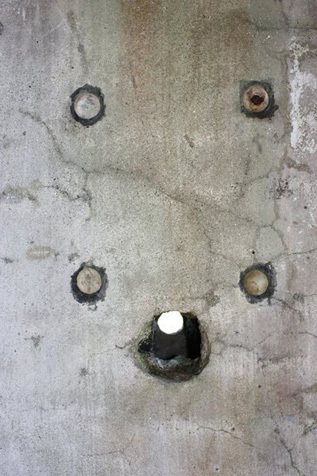 For more details, have a look at Nick Catford's photos and text on the Subterranea Britannica web site. 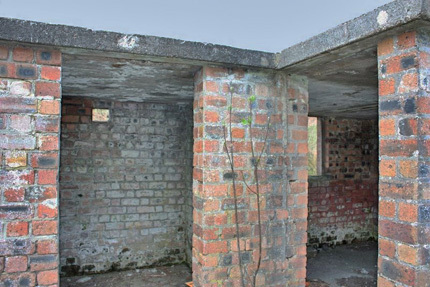 If you know of other WW2 indicator loop stations around the world, please contact me with some of the details so we can correspond. I'm particularly interested in getting information from officers and ratings who worked in the loop stations or laid the loop cables. Also, many scientists were involved in the research at the Royal Navy's "Underwater Detection Establishment". Are you still out there? The Adventures of a Visual Signaller by Stephanie Batstone. Published by Parapress Ltd, 5 Bentham Hill House, Stockland Green Road, Tunbridge Wells, Kent. ISBN 1-898594-70-8. The first edition (1994) was revised and launched on 5th May 2001 with an extra chapter added in which she describes the reunion with USN Signalman Jack Campbell she got to know at Oban. 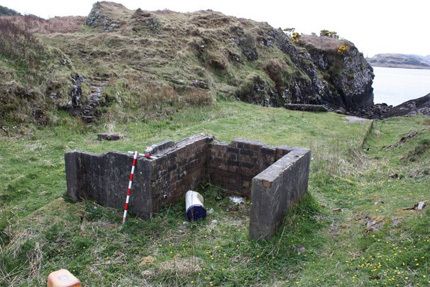 The following extract talks about the loop station at Oban Bay (Little Ganavan Beach). The author, Stephanie Batstone, was a 21 year old visual signaller working at the Royal Navy signal station to the south. 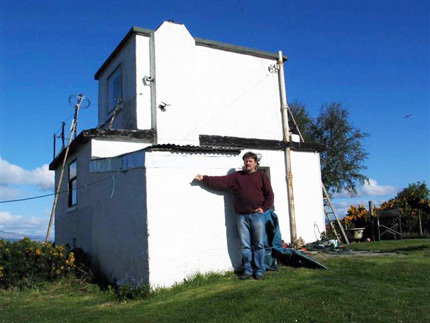 In a letter to me (8th September 2001) she said that she never actually saw the loop huts as they were completely fenced off and quite invisible from the coast road and from the signal station. She said no photos were taken of any of the huts: 'penalty of death I should think'. This extract is used with permission of the author. Next morning Carol and Rosemary reported at 0800 to take over our first watch officially from Fred and Alf. Joan and I relieved them at 1300. We thought what a beautiful romantic walk it was, though the autumn sunshine, better than sitting at a typewriter in London. Past Dunollie Castle on the right we went, along the shore of the little bay with a stupendous view of sea and mountains opening up on our left through a kaleidoscope of shimmering russety leaves, round the headland with its cliff face on the right, over the barbed wire fence, and then a stiff climb up the far side. 'What did Dave say about that little phone with the handle on the box?' I said. I couldn't understand,' said Joan. I hoped you had. Something to do with loops.' At that minute it rang huskily. Joan snatched it up and said in a quavering voice, 'WSS' I could hear a male voice the other end say, 'Little Ganavan - Bert here our DO is on the way up to check your CBs'. The line went dead. We looked at each other thoughtfully, registering DO as Duty Officer and CBs as Confidential Books. But where were they, and why did he want to check them, and what had Dave said Little Ganavan was? Anyway, the place looked fairly clean. We rolled our shirtsleeves down and put our jackets on to be on the safe side. At that moment the husky phone rang again. He rapidly reversed his ladder drill, coming up three at a time, and picked up the phone. 'WSS' 'Little Ganavan, sir,' said a male voice. 'Crossing on one.' He shot a practised eye over the expanse of sea. I indicated a telescope but he waved it away and snapped back, 'Fishing boat, Maid of Mull, outward'. He flashed us a dazzling smile, said rather apologetically, 'She always goes out about this time,' and was away, galloping down the side of the cliff like an antelope. It seemed odd to us that at Cabbala, where it didn't really matter, everyone had gone to such trouble to explain everything. Here, where it patently did matter, nobody thought any explanations necessary. We tried to piece it together. * Note: The green radar screen referred to above was most likely the Cathode Ray Oscilloscope screen for the Controlled Mining (which also used loop although they were usually called 'Guard Loops' or 'Mine Loops' - but worked on a similar principle. An indicator loop (without mines) more commonly used pen and ink to record a line on a continuous roll of paper about 8cm wide. 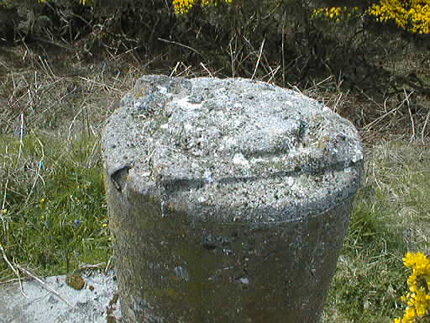 The photos and measurements in this webpage were taken by Martin Briscoe of Fort Williams, Inverness-shire, in 2000 and 2009. I'd like to thank Neil Owen of Oban for additional information and photos. 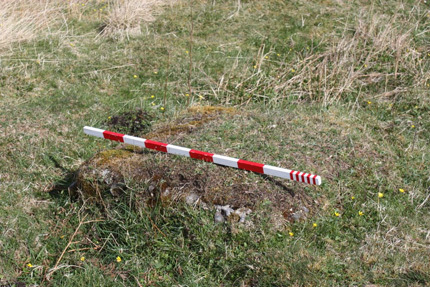 The Royal Commission on the Ancient and Historical Monuments of Scotland (RCAHMS) has the Oban Indicator Loop Station (at Ganavan) on their Canmore database.